Why Choose Custom-Molded Ear Plugs? A custom-molded earplug is a laboratory-made earplug made from molds taken by trained experienced impression takers. In North America the experienced impression takers may be audiologists, licensed hearing aid dispensers, or impression takers well trained by the manufacture. Most often the ear impressions, are made of acrylic or soft silicone that can fit the ear and the ear canal tightly. The advantage of the softer earplugs is they change shape slightly as the wearer’s ear canal changes shape when talking or chewing, thereby continuing to seal during those activities. How is the custom Moulded earplug packaged? The custom- molded earplugs are typically delivered in a protective storage/carrying pouch and will be accompanied with a tube of lubricant (most often petroleum jelly). The lubricant is applied to the earplugs during their initial use/break in period. The lubricant makes the custom fit earplugs easier to insert and also softens the interface of the earplug and ear improving comfort. After about ten or so uses with the lubricant applications can stop as the silicon should have absorbed enough material to be easily inserted for the life of the custom fit earplug. So-called “foam” and pre-molded earplugs are hearing protection devices designed to be used for one time or in some cases, a few times. Exceptions to this restriction are those very expensive earplugs such as the Hi-Fi or military earplug that can be cleaned for repeated use. Until the 1970’s the most common earplug was the V51-R made from soft silicone, a single-flange earplug developed for the military that came in five sizes. Because it didn’t work well, it required precise fitting. Eventually it was discontinued due to repeated pressures from the scientists and practitioners in the hearing health community. Later other earplugs were developed with multiple flanges. An example is shown in Figure 2 along with a fibre formable earplug and a slow-recovery foam earplug. The slow-recovery foam earplug has the widest use in the world. In the United States, it accounts for approximately 75 percent of all disposable earplugs sold. While the V51-R required precise fitting to be effective, the slow-recovery foam earplug requires rolling down into a small cylinder, inserting as deeply into the ear canal as possible, and then, for some users, holding it in place until it has fully expanded and fills the ear canal, a process that can as long as two minutes depending upon the temperature of the earplug; cooler takes longer than warmer to fully expand. As a result, most wears do not get the noise reduction possible with that earplug (Murphy, 2000). 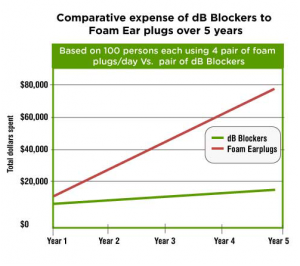 dB Blockers™ custom molded earplugs are much less expensive to use than disposable earplugs or muffs. Save up to 60% over 5 years on a program when an entire facility is fit. The cost per month for dB Blockers™ is lower because you can wear them for 5 years. The purchase cost for disposable earplugs is at least 30¢/day (3 x 10¢/pair) or $6.30 per month for each wearer. This is at least 3 times the cost of dB Blockers™. Ask us for a Return on Investment Calculation based on the savings you’ll receive from a dB Blocker™ purchase.